If you invest in AdWords, you know how critical it is for your ads to stand out. There’s a ton of competition. So even with an incredibly clever heading, paid ads need to make users want to click. You need to grab people’s attention. A great way to do this is with Google AdWords Manual extensions. They’re the difference between a campaign that’s good and a campaign that’s great. Today the team at LoudRumor (we’re a digital marketing agency) is showing you how to make AdWords extensions work for your campaigns. An obvious way to make sure that your ads stand out is to simply add more text and links. Sitelinks act as bookmarks for your business. This manual extension allows you to showcase some of your website’s best sections so that you can link back to internal pages. “Get Your Free Estimate,” “About Us,” and “Gallery” are the sitelinks. Ads that don’t use this extension would just have the title, URL and text. In a sense, sitelinks also serve as additional selling points because they encourage users to click on our client’s “About Us” page and so on. The huge bonus here, though, is that sitelinks don’t use more characters in your text ad. But what you’ll also want to do is test your sitelinks. It’s difficult to tell which pages you link back to in the ad will perform the best. So optimization is key with this extension. As you can see, “Get Your Free Estimate” performed better than the “Roofing Services” sitelink based on the cost per conversion ($751.10 vs. $64.4) and conversion rate (1.77% vs. 28.42%), so we optimized with this in the final ad. For our client, testing their sitelinks made a difference in conversion rate by 26.65% — that’s pretty big. ….and so on. It makes it so much easier for people to find where you’re located without needing to click through to your site. The location extension also links to your Google My Business page pulls your reviews and star rating. It also includes information from Google Plus like your hours of operation. So, if you have multiple locations, you can have all of them in your account. Google will see which location is closest to users when they see your ad and they’ll show that address. If a business is worried that their address will show but they actually serve the whole valley, Google will not show the address unless the person searching is close to the business. So, once we set up the location extension for our roofing company, we wanted to see what kind of results it brought in. Turns out it was responsible for a 21.94% conversion rate; people find this information about a business valuable. The number one conversion that all businesses want is a phone call. Why? Because phone leads are worth 5-10x more in revenue than form submissions. 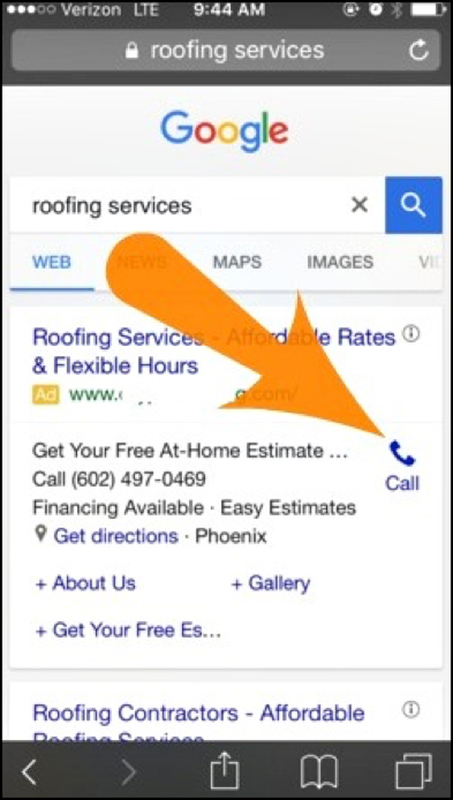 So a great way to encourage people to call your business from your AdWords ad is with the call extension. This adds your business’ phone number so that users can directly contact your business from your ad. Again, just like the location extension, a potential customer won’t have to click through and investigate to find this information. It’s convenience at its finest. The call extension is especially great for users who search on their mobile phones. It allows them to click a “call button” on your ad that encourages them to directly dial your number. When you use the call extension, Google notes that this can increase your CTR by up to 8%. When we added this to our roofing client, the call extension received a 19.00% conversion rate. It was a huge go-to for people interested in our client’s services. Access your ‘9-Part Google AdWords Set Up Plan’ Execution Plan in Digital Marketer Lab. Set your Google AdWords Account up the right way the first time. From creating your account to writing ad copy to measuring your results — we’ve got you covered. 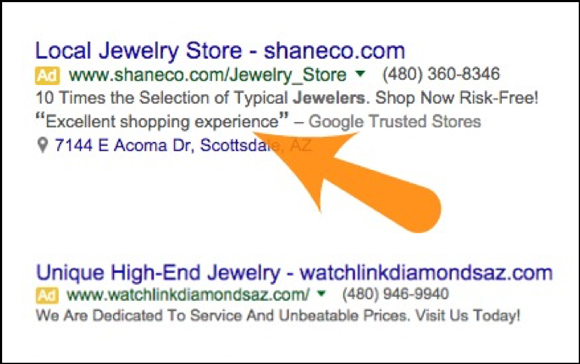 A lot like sitelinks, callouts allow you to highlight certain aspects or services about your business. Callouts can point out credibility, offers, and so on. Unlike sitelinks, though, they can’t be clicked. But they do allow for more text space other than the 35 character limit for the ad itself – so that’s a great perk. Businesses can highlight certificates, specials, etc. that make them stand out more than their competitor’s ads. You get to dictate what users see about your company first. The app extension is built for businesses who have a feature through the app store or have created an app themselves. If this fits your company, the app extension can be a huge benefit because it allows you to highlight your app directly in your ad with a link. Setting this up drives traffic directly to the app so it’s easier for users to find. Essentially, this extension allows for fast access to whatever niche service you focus on in your app. It comes as no surprise that smartphone users spend 89% of their mobile media time using mobile apps. Take advantage of that with this extension. Why do business reviews matter? Because 88% of consumers trust online reviews as much as personal recommendations. This extension allows you to pull from third-party reviews and include them in your ads. Once you do meet all of these guidelines, though, you’ll start to see a difference in your ad’s performance. Ask the DM team and 9,036 other members in the DM Engage Facebook Group! Mike Arce is the founder and CEO of Loud Rumor, a 7-figure advertising agency for fitness and wellness businesses. After growing that company from 0 to 500+ agency clients in fewer than 2 years with his video selling strategy called GSD VidMachine, he now teaches other ad agencies how to scale through his educational program: Agency GSD. Mike is also the host of 3 top video podcasts, The G.O.A.T. Show, The BOLD Show, and The GSD Show, where he's interviewed renowned guests like Grant Cardone, Ryan Deiss, Russell Brunson, and more.